My fascination with turtles seems to grow everyday. I’m not really sure when it started but my desire to learn about them takes me to different websites and places whenever I can. This past November, my husband and I travelled to the Mayan Riviera for the fourth time and through a couple of friends we have made there, took a car ride to AkumalBeach. Our goal was to swim out from shore and do a bit of snorkelling in hopes of seeing a sea turtle. My husband swam out further, so in total he saw about twelve, while I saw five plus a small Ray! My favourite moment was when I was floating above a rather large turtle, who after looking up at me, swam up to the surface in front of me (about an arm’s length) for some air. It then swam back down to the bottom to continue feasting on sea grass. Needless to say, I was more excited than the turtle. I guess they are used to sharing their space with us. 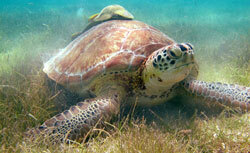 AkumalBeach is home to Loggerheads and Green Sea Turtles. I’m not sure which one I had the close encounter with but when we go back in March, I’ll be taking our underwater camera in with me. Last summer I adopted a blind Kemp’s Ridley sea turtle, who will spend the rest of his very long life, at the Karen Beasley Sea Turtle Rescue and Rehabilitation Centre, in Topsail Island, North Carolina. I look forward to going back next year to visit again. On Decemtber 28th, an organization in Florida named Mote Marine Laboratory Sea Turtle Conservation and Research Program, released Johnny, a rare 68 pound Kemp’s Ridley turtle that had somehow made his way from the Gulf of Mexico to Europe. He was stranded in the Netherlands and was rescued by the Rotterdam Zoo, from there, he was sent to the Oceanario de Lisboa Aquarium in Portugal and later sent to a rehabilitation facility at Zoomarine in Portugal, where he spent most of the past three years. Once it was determined that he was from the Gulf of Mexico region, arrangements were made and he was flown to Florida in November 2011. Johnny was released back into the warm waters of the Gulf with a satellite transmitter attached to his shell that will allow researchers to track Johnny’s whereabouts and progress. What I find most amazing is the love and dedication that organizations, world wide have for turtles and not just sea turtles! Volunteers spending endless hours helping these incredible creatures, by educating the public, marking off nesting sites, helping the newly hatched baby turtles into the ocean and by nursing turtles back to health from injuries obtained in a variety of ways. Most have websites if you would like to explore further. By-line: Kids for Turtles Environmental Education is an educational and outreach organization working to bring a better understanding and stewardship to the environment around us.